Take what is already a great valued guitar, and add two hot, contemporary Alnico humbuckers, and voila....the Les Paul Special - Humbucker. 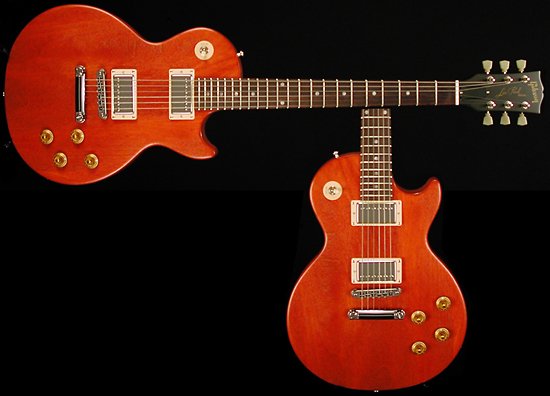 The Special-Humbucker has an all-mahogany body and a 1960 slim tapered mahogany neck. The 22 fret neck (rosewood board) is marked with dot inlay. The cool worn-cherry finish adds not only to the vibe, but also gives a little extra warmth and "broken-in" feel. It has a tune-o-matic bridge and a stop tailpiece and chrome hardware. For electronics there are 2 covered alnico magnet pickups, a 490R Alnico magnet humbucker in the neck position and a 498T Alnico magnet humbucker in the bridge position. The controls are the standard two volume, two tone, three-way switch arrangement. Some young man stumbles into a local music store here in Paris, Texas and sells this guitar to the owner! I stumble in right behind him and play it, WOW, it's all there man, it's like new and now it's Mistabluesmans! I just love it and does it ever make my Ampeg Reverb Rocket amp just frickin' stand up and scream! Now, I know you have heard of double neck guitars but, have you ever seen one of these? This bad boy, I can play going no matter which way I wanna' walk. Yes, mostly on the high notes! The real un - Doc turd photo is below! Now who is the goofiest blues guitar player you know? If it's me - Click Here! Am I happy? HELL YEAH MAN!!!!!!!! !